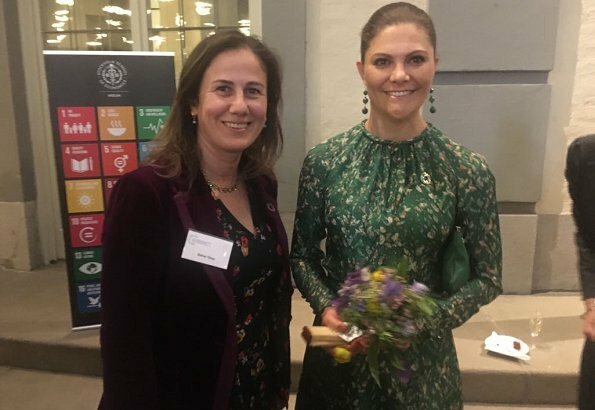 On May 15, 2018, Crown Princess Victoria attended Sustainable Development Solutions Network (SDSN) Leadership Council meeting held at Stockholm School of Economics. 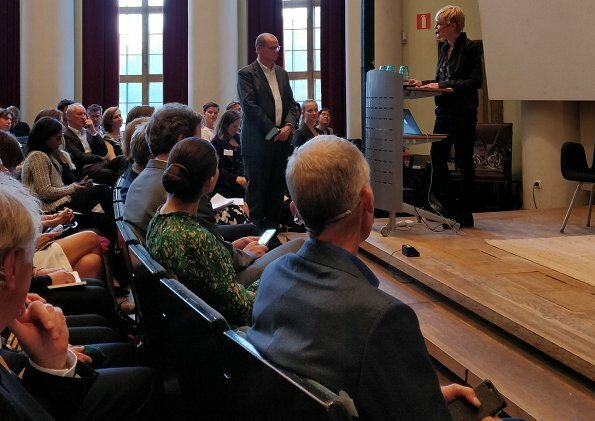 Leadership Council consisting of sustainable development experts from academy world, business world, nongovernmental organizations and public sector supervises the activities of SDSN. At the meeting, embodiments of sustainable transformation continuing in Sweden and failing points of the action plan were discussed. Again Vic wore this beautiful dress.I like it with this shoes -looks fresh and young. 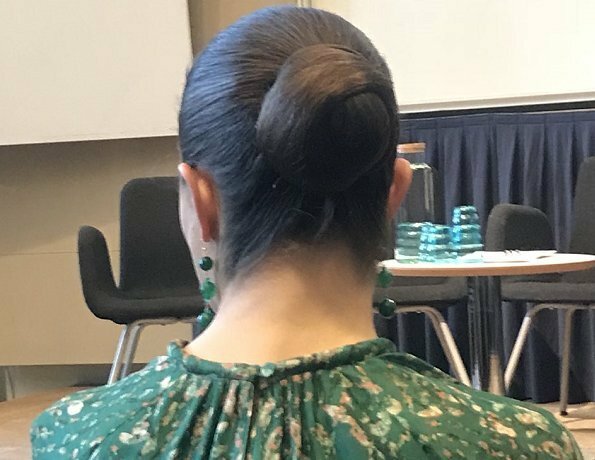 Green is a great colour, and I think it´s underrated in fashion, but I cannot like this. 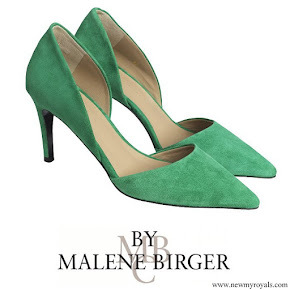 It´s the algae design again that we just saw on Mary the other day. Not the nicest pattern I can think of. If you have to have an all-over green (floral?) print, you need to go easy on everything else because the colour is a strong feature already. This dress needs simplification. Open up the neckline, shorten the sleeves to elbow-length at least, make the skirt knee-length, add a contrasting element for the eye to rest on (beige belt?) and definitely beige or off-white accessories. 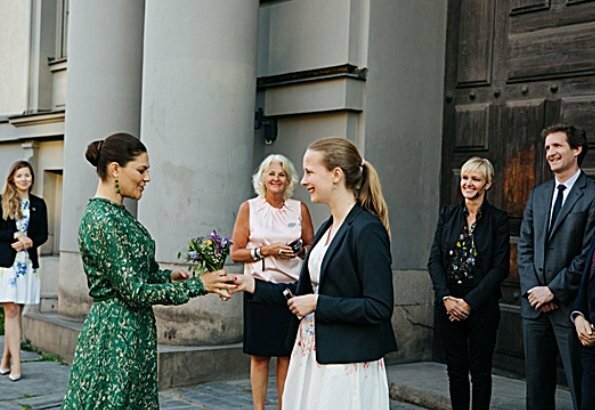 Instead, Victoria went for more green (earrings, purse, shoes) which really is too much, and the greens in the shoes don´t even match. It's the pattern - maybe nice for a cushion or a bedcover. Personally I like green for fashion and it's basically a colour for her. The cut of the dress is a disaster! 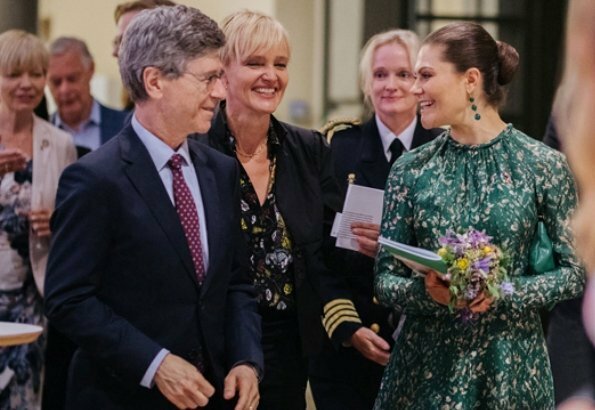 I love the green dress on her. She looks wonderful. Pretty dress with the flower pattern. I like the matching green shoes and the fabulous earrings help to frame her face. I love the whole look. She looks great. I love this dress on CP Victoria and I love the green shoes, but agree that beige/neutral accessories might be better. The earrings are fab and she looks great. 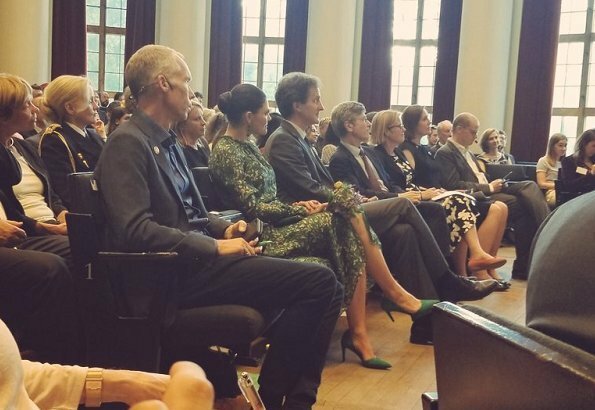 CP Victoria looks wonderful today again.The dress looks good on her, also like her hairstyle and makeup.